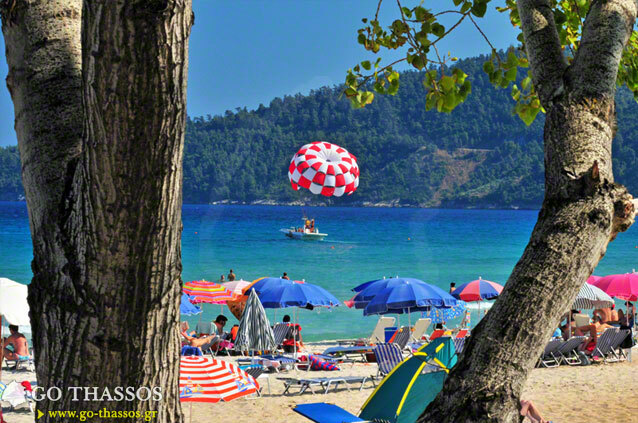 This spectacular beach resort has become one of the most popular destinations for visitors to Thassos. 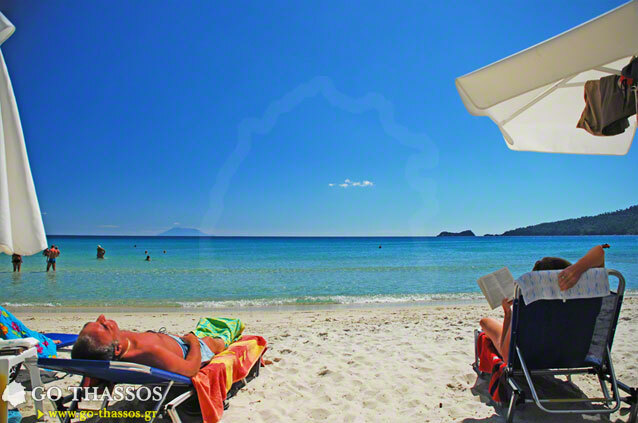 The resort is located along the shores of the fabulous Golden Beach, one of the longest sandy beaches in the whole of the Aegean Sea. 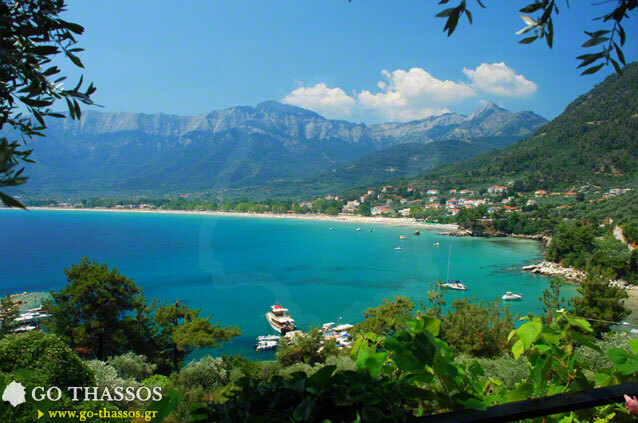 The beach is two and a half kilometres long and spans to the south to the village of Skala Potamia. The beach has fine white-golden sand, and only in a very few places are there to be found pebbles and stones. The sandy beach shelves gently into the sea, making it very safe for children and those who are more nervous swimmers. In places, the gently-shelving shore can become deeper, making it an exciting place for the stronger swimmer or for older children. 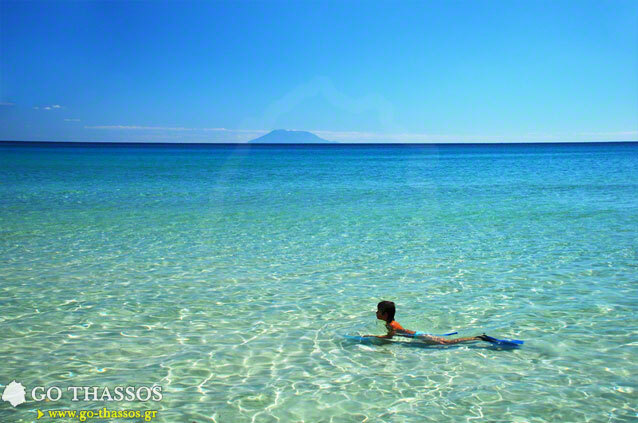 The waters here are spotless, and there are numerous possibilities for activities on this wide and long beach. There are volleyball nets for the active beach-goers and beach tennis along with other ball games that are very popular. 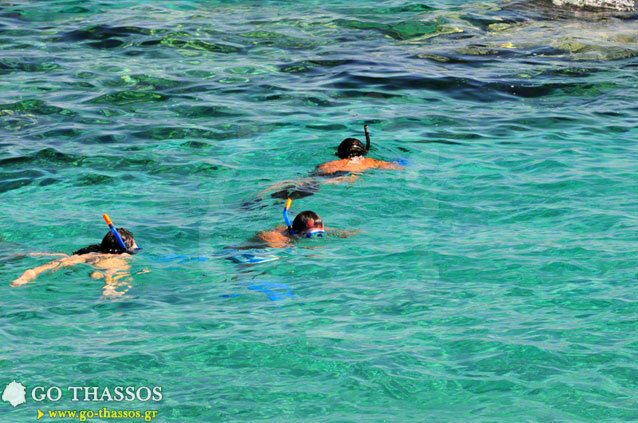 In the water, snorkelling, jet-skis, the banana boat, parascending, sailing, wind surfing, kayaking and water skiing are some of the activities one should expect to find. For the more laid-back visitors, there’s never a lack of sunbeds where one can lounge and gaze into the deep blue horizon. Golden Beach is also a proud winner of, for many years now and counting, two Blue Flags of excellence. Golden Beach is a relatively new resort, having been developed just over the last couple of decades. 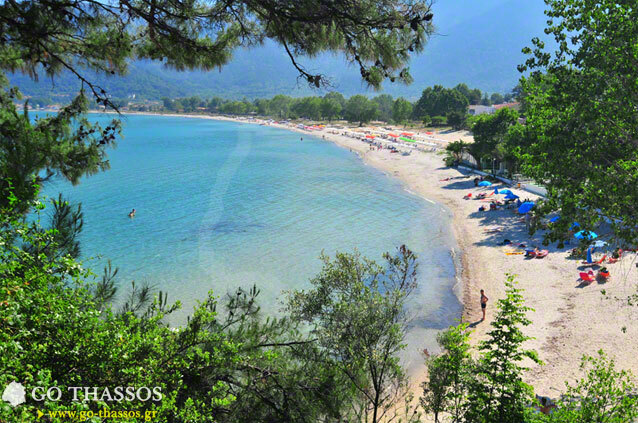 Ever since the very first visitors who came to Thassos, this is one of the areas to which they were drawn again and again. More and more people are choosing to come and live here on a permanent basis as attractive new residences are being built into the foothills of the mountains, and as more shops and year-round services are becoming available. Fine hotels and bungalow complexes as well as holiday studios and apartments are being built, from the more humble, though comfortable and spotlessly clean, right up to the 5* hotels. 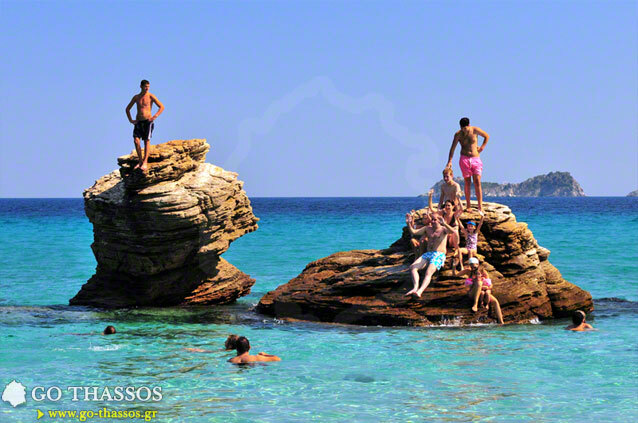 Plots of land here have acquired a particularly high value since Skala Panagia and Skala Potamia have been developing fast due to a high demand from tourists - from all over the world - who visit and love it and want to have their own little piece of this island paradise. 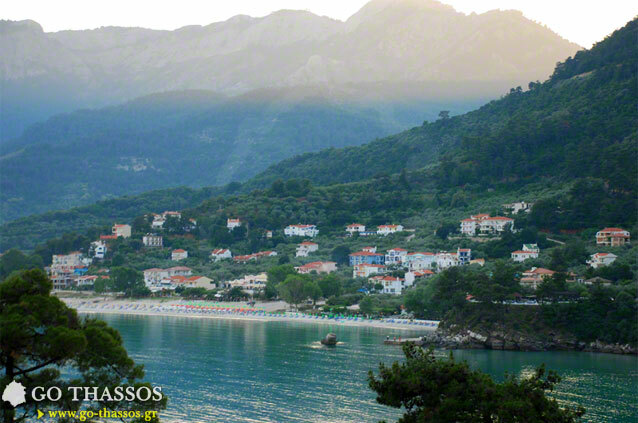 It is indeed a true paradise, and a unique area of the island of Thassos, of the Aegean and the Mediterranean, with the steep grey granite of the mountains rising sharply behind, the green of the pine trees and plane trees in the foothills of the mountain, interspersed by the silver grey of the olive trees. Wildlife abounds here, a bird watcher’s and a nature lover's dream, it is pleasant to stroll along the trails leading back from the beach. Then you always have the beautiful sweep of the golden sand of the long bay of Golden Beach, calling you to swim at the end of the day. 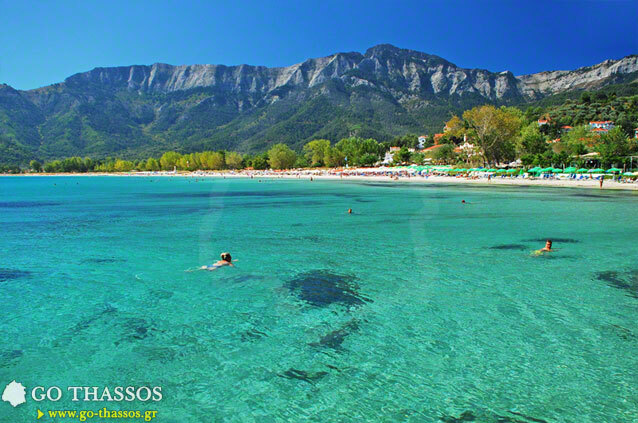 During summertime, a water taxi makes the trip twice a day between Limenas and Golden Beach, stopping at Makryammos Beach on the way. This boat ride is a pleasure in itself, giving a lovely view from the sea inland, to coves which one would possibly not visit unless one had a jeep, rugged motorbike, or sea vessel. During the summer months there is every type of shop, restaurant, bar, café and snack bar that anybody could wish for. A plentiful supply of very fine quality rooms to suit all budgets exist, but it is necessary to book well in advance for the six peak weeks of the season, as this is such a popular destination. In this area there are some very fine restaurants providing local delicacies, home-cooked, and the freshest fish, meat, vegetables and salads. For those who wish to visit and do not have a car, it is well served by the local bus service which offers smooth, comfortable and air-conditioned journeys, an excursion in itself, as well as the very reliable and comfortable island taxis. The small resort is full of life and people during summertime but is quiet and peaceful in the winter season. Most of the business owners move to their winter residences in the villages of Panagia and Potamia and deal with their other occupations which are namely fishing, beekeeping and honey collecting, picking and pressing their olives in the local co-operative olive press, (Thassian oil is some of the finest in the world) and, once the grapes have been picked, making Tsipouro, the fiery but aromatic drink which is typical of the region and which is drunk regularly by visitors to the island as an appetiser at the start of a meal. Try it, you'll love it (or maybe not - it’s strong!!). In the winter the beach becomes a beautiful place for solitary walks or for taking regular exercise - a fabulous time of the year to be at peace with oneself and to enjoy the unique beauty off this region.